Got teenagers? Bet you have trouble getting something decent in their stomachs before they run to the bus on weekday mornings. Here’s how the school day unfolds in my house. My 16-year-old rolls out of bed, bleary-eyed and this side of grouchy, about 20 minutes before his teenaged chauffeur shows up at 7 a.m., affording him barely enough time to drain our water heater and pull on a rumpled T-shirt, let alone sit down to a bowl of cereal. My reluctantly curly-haired 14-year-old daughters, meanwhile, have a standing 6:30 a.m. date with their flat irons. So by the time they join me and my husband at the kitchen table, they’re also counting the seconds to blast off. No kidding. According to the American Dietetic Association, more than two-thirds of teenaged girls and half of teenaged boys regularly skip breakfast. Yet even when they do make it downstairs with minutes to spare, eating isn’t a priority. Having gone to bed too late and then gotten up too early myself, I don’t have a hard time relating: When you’re tired, the mere thought of eating can make you nauseous. Countless studies have shown, though, that kids who enjoy breakfast are more alert and perform better in school. A protein-rich breakfast also can reduce the number of calories they take in during the day, helping your child maintain a healthy weight, and perhaps — a recent study funded by Japan’s health ministry suggests — even help them keep their virginity longer. My job, then, is to get something tasty into my teens’ bellies before the head out the door. Of course I want it to be as (deceptively) healthy as possible: in other words, no processed foods that are overly high in fat and carbohydrates, or sugary cereals that will give them a mid-morning hypoglycemic crash. (Cereals with 7 grams or less of sugar per serving usually are a good bet; if they balk at eating your whole-grain “good” choice, allow them to go halfsies.) With five kids, I’m enough of a realist to also understand that beggars can’t be choosers and that something, anything — even a half a bagel or a toaster pastry — is better than nothing. Given most teens’ mad rush out the door, a school-day breakfast first of all should to be fast. That means items that can be prepared a couple days or the night before, such as homemade oatmeal breakfast cookies, or thrown quickly together in the morning — say, a whole-wheat waffle or apple slices spread with peanut butter and drizzled with honey, or a cup of low-fat yogurt mixed with fresh fruit and granola. Even better is a breakfast your kid can wrap in a paper napkin and take with him. Instead of serving scrambled eggs with toast, for instance, consider wrapping them inside a whole-wheat tortilla with some veggies and a bit of shredded cheese. Here, we offer some grab-‘n’-go dishes that will entice your teenager to not only think about breakfast, but also actually eat it. Many of them also will make a nutritious after-school snack for kids who go from the classroom to the sports field or other activity. My guess is that even mom and dad will find them tasty. OK, so breakfast pastries aren’t exactly on most nutritionists’ lists for healthy breakfast. But are these delicious — and that means your kid might actually grab one on his way out. 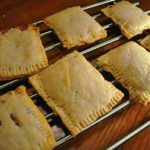 Whereas store-bought ones smack of cardboard, these flaky pastries will melt in your mouth. I suggest making 2 batches at a time, so you have extras in the freezer. I’m not the best baker so it took me a few tries to get the dough not to stick to the rolling pin and to roll it to the proper size (I traced a rectangle on the back of a piece of parchment with a Sharpie). But all in all, these are fairly simple to prepare. You might want to add a bit more jam and experiment with other fillings. For breakfast after a Saturday night sleepover, we made them with marshmallows and chocolate chips. Additional filling ideas: cinnamon sugar, Nutella, dulce de leche. Prepare strawberry filling by whisking together the cornstarch and water, and then combine with the jam in a small saucepan. Bring to a boil and simmer for 2 minutes, stirring frequently. Remove from heat and let cool. To make crust: Whisk together the flour, sugar and salt. Using your fingers or a pastry blender, work in the butter until it is the size of peas and the mixture holds together when you squeeze it. Whisk together the egg and milk and add to dough. Mix together with a fork until everything is evenly moistened. Knead briefly on a floured surface, if necessary, until dough comes together. Using a sharp knife, pastry wheel or bench scraper, trim rectangle to 9-by-12 inches. 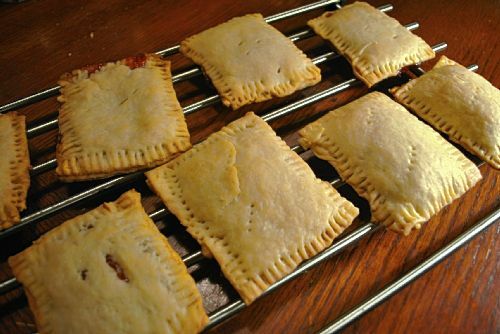 Cut the sheet of dough into 9 3-by-4-inch rectangles. Using a spatula, transfer rectangles to a baking sheet that has been lined with parchment paper or a silicone mat. Brush the lightly beaten egg on each of the rectangles. Spoon a tablespoon of filling in the center of each rectangle, leaving 1/2-inch of space around the edges. Refrigerate pan with the pastries, uncovered, for about 30 minutes. In the meantime, preheat oven to 350 degrees. Bake for 25 to 30 minutes, or until lightly browned. Cool slightly before serving. Store pastries in an airtight container at room temperature for up to one week. Wrapped in aluminum foil, these protein-rich after-school snacks will give your kid a boost before sports practices. In a small bowl, stir together the peanut butter and caramel topping. Spread on the graham crackers. Place 1 apple slice on each graham cracker square. Some kids might find these a little “healthy” tasting. (Or as my colleague Kate put it, “You need a little coffee to help wash ’em down.”) I say just add a few more dried cranberries, or maybe a handful of chocolate chips, and your kids won’t know they’re eating something that’s good for them. I substituted 1 real egg for the egg substitute and left out the pecans. Preheat oven to 350 degrees. Lightly spray 2 large baking sheets with cooking spray. In a large mixing bowl, using an electric mixer on medium speed, beat the applesauce, honey, egg substitute, orange zest and juice, brown sugar, oil and vanilla for 1 to 2 minutes, or until smooth. Meanwhile, in a small bowl, stir together the flours, baking powder and baking soda. Add to the applesauce mixture, stirring just enough to combine. Beat on medium speed for 1 to 2 minutes, or until completely combined. Add the remaining ingredients. Beat on low speed just until combined. The dough will be slightly sticky. Using a tablespoon, drop by slightly heaping tablespoons onto the baking sheets, allowing about 1 inch between cookies. Using fingers, slightly flatten. You should have about 30 cookies. Bake for 12 to 15 minutes or until cookies are lightly browned. Immediately transfer the cookies from the baking sheets to cooling racks. Let cool for about 30 minutes. Store any leftover cookies in an airtight container, such as a cookie tin, for up to 4 days. If you prefer softer cookies, store in a resealable plastic bag. I watched Martha Stewart prepare these on “Today” and they looked so good (and easy) that I had to try them myself. Put them in the oven when you start the coffee, and by the time your kids get out of the shower, they’re ready for on-the-run noshing. If your kids don’t eat breakfast meats, make a vegetarian version with sauteed spinach and a sprinkle of parmesan cheese. Lightly butter 6 standard muffin cups. With a rolling pin, flatten bread and, with a 41/2-inch cookie cutter, cut into 8 rounds. Cut each round in half, then press 2 halves into each muffin cup, overlapping slightly and making sure bread comes up to edge of cup. Use extra bread to patch any gaps. Brush bread with remaining butter. In a large skillet, cook bacon over medium heat until almost crisp, about 4 minutes. Lay 1 bacon slice in each bread cup. Crack 1 egg over each cup. Season with salt and pepper. Bake until egg whites are just set, about 20 minutes. Run a small knife around cups to loosen toasts. Serve immediately. I used cherry-flavored prunes in these bars and, to further tempt my daughter to eat before cross-country practice, dusted them with cocoa. Put the dried fruit, oil and honey in a food processor and puree until smooth, adding fruit juice a little at a time to keep the machine running. You’ll need to stop once or twice to scrape down the sides of the bowl. Fold in cereal until evenly distributed. Take a heaping tablespoon of the mixture and roll it into a ball. If you like, roll ball around in the coconut, nuts or cocoa. Put balls between layers of wax paper in a tightly covered container and refrigerate until set, about 45 minutes. Eat immediately, or store in the fridge for up to several days. You also can wrap the balls individually in wax paper, like candies. To make bars, line an 8- or 9-inch square or round pan with foil. Follow recipe through Step 1. Spread mixture in the pan, pushing it into the corners and evening the top. If you like, dust the top with coconut, nuts or cocoa. Refrigerate until set, then cut into squares.